ENJOY A FAIRY-TALE CYCLING VACATION IN FRANCE! Make your plans today for a truly unique cycling vacation at the Chateau de Saint-Martory in southwestern France this fall or in 2019! 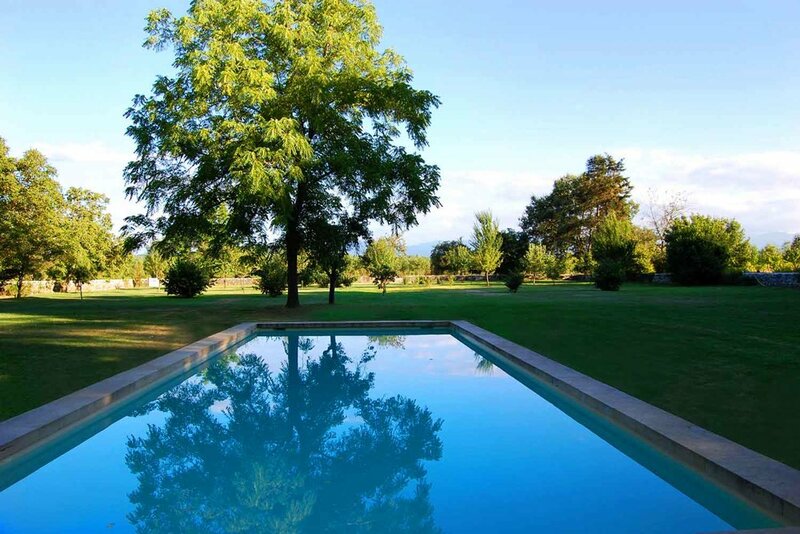 We are happy to announce that we are working directly with the owners of this gorgeous 16th Century Renaissance castle that is nestled on the banks of the Garonne River and near the famed Tour de France climbs of the Pyrenees! Thus, one can choose to ride the flat roads of the river valley, discover the rolling sunflower fields, farms, and charming villages to the north, or venture into the nearby legendary roads of the Pyrenees. During our vacations here, we have an agreement with the owners for full access to the entire property. Thus, consider it your own private estate for a week! This includes all sleeping rooms in the chateau (7) and the adjacent farmhouse (3), as well as access to the kitchen, swimming pool, and the shared living spaces throughout the chateau. All seven chateau rooms have their own full bathroom, while two of the three farmhouse rooms share one. In addition, our local private chef does an incredible job customizing menus around cyclists needs and any dietary restrictions. The Chateau has a dedicated storage space for bicycles with all the necessary tools. Everyone is encouraged to bring their bike though we can arrange a rental for you for an additional fee. We currently have dates set up for October 2018 (autumn in France!) and for the 2019 Tour de France. If these dates don't work for you, please contact us below with dates that you would like for your cycling vacation! You can customized your itinerary to suit the needs of your group. Please note that this itinerary is simply a suggestion and can be altered. Day One: Welcome to France! Following your arrival at Toulouse-Blagnac Airport, we'll transfer you to the Chateau Saint-Martory where you'll check-in and build up your bike or get your rental bike fitted, This afternoon, we'll enjoy a short warm-up spin along the banks of the Garonne River while our private chef prepares your "Welcome Dinner" for this evening. Day Two: Postcard French Villages. Today's ride will be focused entirely on the beautiful rolling countryside north of the Chateau where we'll ride on quiet country roads through fields of sunflowers and vineyards during harvest season. This afternoon, our chef will prepare lunch for us before our BBQ dinner this evening. Day Three: Col des Ares Loop. Following breakfast and coffee, our program for today will showcase the Col des Ares, one of the climbs in the region that has been showcased on the Tour de France. Day Four: "Most Beautiful Villages in France" Ride. Our destination for today is St. Bertrand de Comminges, one of the official "Most Beautiful Villages in France." Additional highlights include the picturesque villages of Barbazon, Valcabrere, St. Gaudens, and many others. This evening, we'll celebrate the day with our specially-prepared dinner. Day Five: Col de Mente' Loop. This climb became famous in the 1971 Tour de France when Eddy Merckx and Spain's Luis Ocana battled it out here for the Yellow Jersey. Following our return to the Chateau, enjoy a post-ride swim before fueling up for tomorrow with our chef's choices for lunch and dinner. Day Six: Midi-Pyrenees Ride w/options. Today you will enjoy the colors of the fall foliage as we ride through the forests and valleys of the Midi Pyrenees around the village of St. Girons. If you are wanting to climb, the Col de Catchaudegue and the Col de la Core are available. This evening, our chef will prepare our "Farewell Dinner" to celebrate our week. Day Seven: Transfer Day. This morning, we will transfer you to Toulouse-Blagnac Airport for your return flight home. Private use of the fully-restored Chateau de Saint Martory (16th Century) for the entire duration of our stay. This also includes the pool, pool house, private gardens, and barbecue areas. Entire property privatized for our group. Full staff at the chateau. Airport transfers to-and-from Toulouse for you and your bike case. Meals with customized plans if desired. Our private chef will take care of it for you! Secure bike Storage with professional mechanics area. Legendary Velo Echappe' pro-style on-road support. Pro-bike rental options (additional charge). Perfect for private groups, cycling clubs, coaching organizations, cycling associations, etc. Contact us today to start planning your vacation at the Chateau Saint Martory!